Movie Review: Writer-director Andrew Bujalski transits from “Computer Chess”, a quirky adventure involving weird chess players competing in an even weirder tournament, to an indie romantic comedy entitled “Results”, which manages to escape the traditional, even if it ends up landing there in the final act. The story follows Danny Ross (Kevin Corrigan), a desolate recently-divorced rich guy whose frustration and disorientation impel him to fight laziness by enrolling in a gym called ‘Power 4 Life’. There, he meets his new attractive personal trainer, Kat (Cobie Smulders), known for freaking out with the clients who give up her classes. She sort of pities him, but simultaneously finds him funny, truly appreciating the honesty revealed about all the junk food he eats. But not only the food, also the weed he smokes on a regular basis. The super-weird Danny resolves to buy two years of classes in advance, which would take place in his own mansion. After a couple of sessions, Kat and Danny are smoking weed together and kissing each other. The next class brings even more surprises when he prepares a fancy dinner with romantic live music, a situation that drives her mad. From then on, it’s Trevor (Guy Pearce), the gym’s owner, who is given a bit more prominence in the story. He has feelings for Kat, despite embarking on other amorous adventures, and got upset after knowing that Danny crossed the line. 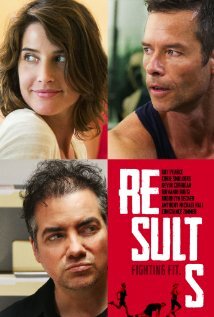 “Results” is definitely a one-of-a-kind comedy whose initial sequences were delightfully amusing, time when we start knowing precious little details related to them. Corrigan is particularly compelling in the manner he conveys his boredom, unhappiness, and depression. However, the mood of the first half slowly decays in the second, and the weirdness gives place to a more familiar, feel-good atmosphere. Regardless the decrescendo in quality and originality, this is not a pointless film, providing a few good laughs along the way.